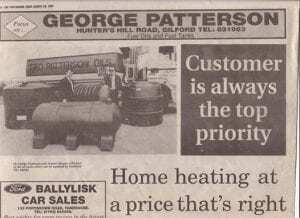 Patterson Oil is a family run business delivering to you since the early 90’s. 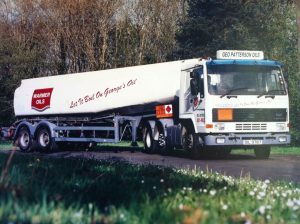 In those early days we began with only one tanker operating around the clock, encouraging you to ‘Let it boil on George’s oil’. As we grew as a business, we realised just how important good service is to our customers. This was so important to us that we became one of the founding members of the Northern Ireland Oil Federation. Each member is committed to upholding a code of practice to ensure the highest quality of service. This ethos is at the heart of our business. We now operate from 4 oil depots across Northern Ireland Belfast, Bellaghy, Gilford and Omagh. From our headquarters in Portadown we control operations across the province to deliver direct to your door. Click on Where we Deliver to see if you live in one of the 80 postcodes we supply. We have invested in the latest technology which ensures a more efficient and eco-friendly service – caring for our customers as well as the environment. Currently we deliver to over 80 postcodes throughout Northern Ireland on a daily basis. As we continue to move from strength to strength we hope to expand our reach so that Patterson Oil becomes a trusted name in your community. We are a family run business. We are the oil brand you can trust. We take an innovative forward thinking approach to our operations. Ensuring top quality service. We ensure you receive the best value for money possible. We want long term relationships. Our customer support is second to none. Call us and see! You can order your oil online securely here.